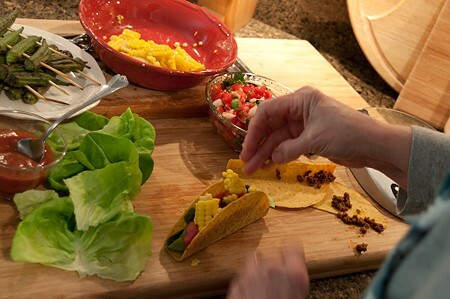 I think most people, especially those with children at home, have one night of the week that is designated as “taco night.” Well, we don’t have little ones at home any more but we still enjoy tacos just as much as ever. That’s why I was happy to participate when the folks at Old El Paso asked me if I’d be interested in working with some of their products. Now you may make all your tortillas from scratch, mix your own seasonings, and even make your own taco sauce and that’s wonderful! Nothing like a homemade tortilla. Yum! But if you’re like most of us you’re way too busy to do that on a regular basis. That’s where Old El Paso steps in to lend a hand with their dinner kits. Each dinner kit contains tortillas (hard or soft), seasonings, and sauce and they’re a fantastic shortcut for a busy week night. 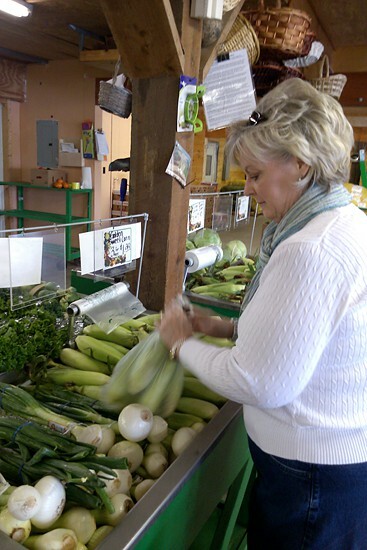 Shopping the local farmers’ market for fresh veggies to “jazz up” our tacos! My challenge for this post was to use fresh veggies from the farmers’ market to jazz up week night tacos. Man, was that ever easy! Farmers’ markets everywhere are just brimming with the best of the season right now. The hardest thing about it was choosing just which delicious fresh vegetables I wanted to buy! I settled on corn (everybody’s favorite, right?) and okra (just being true to my Southern roots, y’all) and I used those to make a jazzed up taco topped with veggies instead of cheese and sour cream. BeeBop and I both loved the freshness the veggies added to the tacos. And, know what? We didn’t even miss all the cheese and sour cream we usually slather on the top. Look around your farmer’s market and choose whatever looks best that day. Maybe the scallions look really pretty. Use them instead of corn. Use whatever you think your family will like best. Because tacos are a familiar food , this is a good way to introduce new vegetables to children. Adding a new veggie into an already familiar food is sometimes easier than introducing it on its own. But you know them best. If you’re sure they won’t be big fans of okra, try serving it on the side instead of in the tacos or substitute another more familiar veggie such as zucchini. Start by preparing the corn. 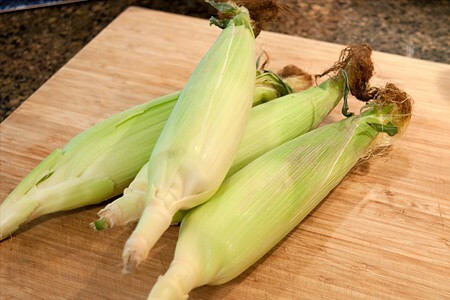 Remove the silks and shucks from 4 ears of corn. Bring a large pan of salted water to a rapid boil. Add the corn. Cover and cook 10 minutes. 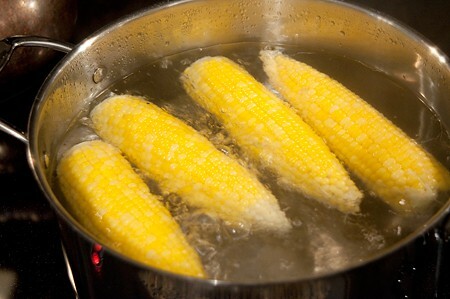 Remove the corn from the water and allow it to cool while you proceed with the rest of the recipe. While the corn is cooking, prepare the okra by tossing the spears with the olive oil, salt, and pepper. Heat a grill pan over medium-high heat. 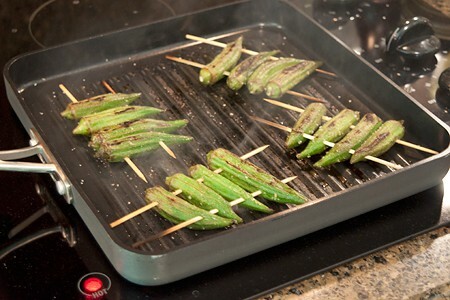 Skewer the okra and place it on the hot grill pan. Cook, turning occasionally, until the okra is tender and has golden brown grill marks. Make the Pico de Gallo by combining the diced tomatoes, diced onion, jalapeno pepper, fresh cilantro, lime juice, and salt in a small bowl. Stir to combine the ingredients. Use the ground beef to prepare the taco filling according to the directions on the Old El Paso Stand ‘n Stuff Taco Dinner Kit. 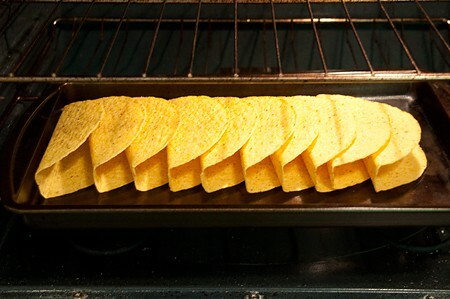 Warm the tortillas while the filling is cooking. When ready to serve, cut the kernels from the cooked corn. Stuff the tacos with lettuce, meat filling, pico de gallo, corn, and okra. Top with the taco sauce included in the taco dinner kit. Yield: Makes 10 filled tacos. 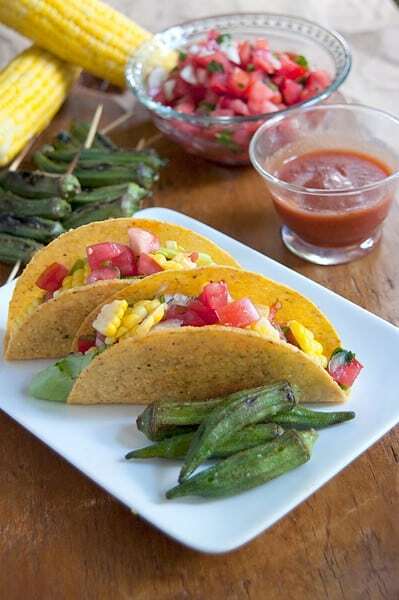 Jazz up your everyday tacos with fresh produce from your local farmers' market! Prepare the corn: To a large pan of rapidly boiling, salted water add the corn. Cover and cook 10 minutes. Remove from water and allow to cool. Prepare the okra: While the corn is cooking, toss the okra with the olive oil, salt, and pepper. Heat a grill pan over medium-high heat. Skewer the okra and place it on the hot grill pan. Cook, turning occasionally, until the okra is tender and has golden brown grill marks. Prepare the Pico de Gallo: Combine the diced tomatoes, diced onion, jalapeno pepper, fresh cilantro, lime juice, and salt in a small bowl. Stir to combine ingredients. Set aside. 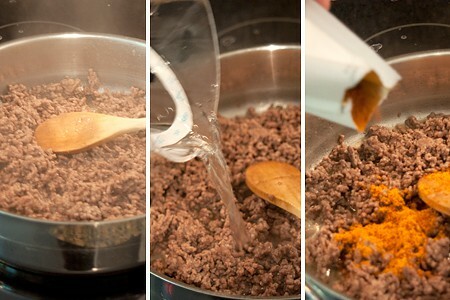 Use the ground beef to prepare the taco filling according to the directions on the Taco Dinner Kit. Warm the tortillas while the filling is cooking. When ready to serve, cut the kernels from the cooked corn. Stuff the tacos with lettuce, meat filling, pico de gallo, corn, and okra. Top with the taco sauce included in the taco dinner kit. Ooooh these look good. Wish I had some right now. Tis is a keeper. It’s a really good way to add several servings of fresh vegetables to your tacos. And it lowers the calories, too, by replacing the cheese and sour cream. Yes, it’s definitely a keeper. Those look fantastic. I have been trying to increase the veggie aspect of our usual dishes. What a great idea. And you just can’t best the Old El Paso products. They always deliver ! Their dinner kits are really convenient, aren’t they? I’ll be sharing some more recipes using them in future posts. Old El Paso is pretty much the only brand I use! And I make tacos at least once every other week because they’re so easy and delicious! In fact, tonight will likely be taco night :) I love the fresh corn in yours! Thanks Sues! The corn is so delicious in tacos. Well worth the few extra minutes of cooking time.